Ok, I guess I need to start this blog by apologising to all the crazy people out there that thought my last blog was serious. While I love Hoi An very very much, I do love my family a little more and will be coming home at the end of next week. I thought I was being funny but clearly I need to work on that aspect of my personality just a little (or maybe even a lot). The heat has been getting to me a little over the last couple of days and I have to say I have spent a bit of time in my hotel with my good mate the air conditioner, trying to keep out of the 40 degree heat and ridiculous humidity. I guess I should explain the bombs and buses title of this blog, starting with bombs. Well on Saturday we (my friend Van) and I were at Cham Island, standing on the beach when all of a sudden there was a huge explosion. I nearly jumped out of my skin and apparently the look on my face was priceless. While I was questioning whether the Vietnam war was in actual fact over, Van was rolling around the floor in hysterics. After I stopeed my heart from racing, she explained that this was only the locals blowing up the mountains on the island so they can get the stone for building. She, along with every other local she has told have laughed at me, saying ‘there are no bombs in Vietnam’ to which my response was – ‘that was what they said in Bali as well’ (no disrespect intended). As for the buses, well they tend to have no problem driving on the wrong side of the road and today was no exception when I went to help Van pick out a new mobile phone during our lunch break. On the way home (with me on the back of her motor-bike) I felt we came just a little too close to a very large bus. I commented to her as we passed it that I would fit perfectly underneath it and would prefer if that didn’t actually happen. She of course thinks I am hilarious because unless you actually get hit there is really nothing to worry about. Go figure hey!!!! Had the yummiest dinner ever – traditional vietnames pancakes for the grand price of $3.50 for both of us. Seriously Mark, we really should move here!!! Am definitely going back there before I leave and not because of the price but because it was truly one of the most beautiful dishes I have ever had. As for volunteering, I am loving every single minute of it. We have redesigned the PIC website, are nearly finished a newsletter template and have written several articles. I love being in the office with Van, Thuy and Duong. They are wonderful and amazing women and we have lots of fun. 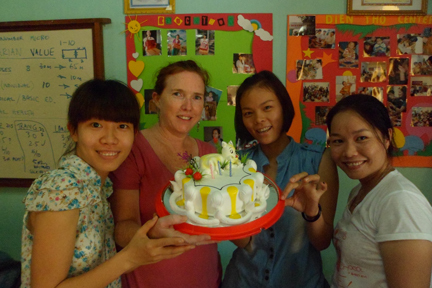 This month marks the tenth anniversary of PIC and we celebrated today with cake!!! Personally I would like to congratulate Geoff and his amazing Vietnamese team for making such a difference to these communities. I am so happy to be a part of this is some small way. PS. the cake was really good. May 23, 2013 in Blog Posts. Don’t worry, I will be happy to try and recreate the WHOLE experience for you at home if you like.